Welcome to our slice of heaven located on Kahana Beach, a calm sandy beach great for swimming. Our condo is the perfect place for families who are vacationing on a budget. If you are looking for a place that feels like home with room for the whole family, then you have come to the right place. Kahana Villa is ideally located between the resort areas of Kaanapali and Kapalua. You are within a 10 minute drive of major hotels, fine restaurants, 5 championship golf courses, but still far away from the crowds. Just a few short steps and you are on a quiet sandy beach perfect for the whole family. Enjoy over 1400 square feet of living space with 2 BR and 2 BA. 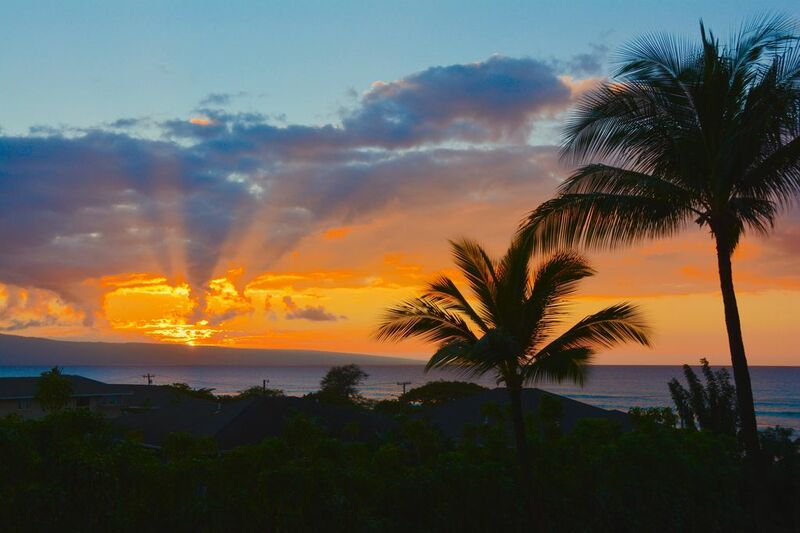 Enjoy the great Maui sunsets on your private lanai. The condominium is furnished with everything you need for a comfortable stay. Living room with a LCD TV, DVD, stereo and CD player. An air mattress provides sleeping for 2 additional persons. Also included are beach chairs, towels, boogie boards, snorkel equipment, etc. Fully equipped modern kitchen with microwave, refrigerator w/ice maker, coffee maker, all dishes and utensils. Pack light there is a washer and dryer too! You will wake up to a view of the ocean and the island of Lanai from the queen size bed in the Master Bedroom with its private bath. The second bedroom with queen bed gives you a great view of the West Maui mountains with the bath adjacent. Pool, Spa and Tennis Court just steps from your front door. In the Winter watch whales from your lanai. We looked at over 30 condo developments and chose Kahana Villa because of the size of the unit. When we bought it, we were hoping that someday we would be bringing our grandchildren to Maui. We bought at Kahana Villa because we have a beautiful view of the ocean and the condo never feels crowded. Close to all the major resorts, but in a much quieter location. We are between Kaanapali and Kapalua. Never are we at our pool with 200 people with the lounge chairs linked together. At times you feel as though this is your personal resort for you and a few friends. Wonderful, well stocked and clean condo. We loved staying here. The condo was really clean and well stocked. It had everything that we needed and it was a great place to stay for our vacation. Thank you Serena. I am so glad that you had a great vacation. You are welcome at any time. Takes a bit to become accustomed to no A/C however early mornings and evenings/overnights were breezy and cool enough. Not there much during the day so really not a big issue. Great spot. Easy access to busier areas. Thanks for your comments, especially about the air conditioning. The natural trade winds keep the condo comfortable. A lot of people visiting Maui for the first time ask about air conditioning so your comment is helpful. Great central location near many beaches. Very spacious for our family of 5. Lots of beach accessories (coolers, boogie boards, snorkels). Great view. Overall great value! Thanks, Ken! Thank you, I am glad you had a great time with your family. Our goal is to make you feel like you are in your home but with a great beach. Location is perfect. Views are legendary. This place has everything that you could want. Seriously. You name it? It probably has it. I can say that we definitely will be coming back. I can’t say enough good things about the condo. Thank for the kind review. I am glad that you had such a great time at our condo. You are welcome any time. The best aspect of this place was a nice view. The place was not particularly clean and one of the aero beds provided required fixing by one of my guests due to a leak. When we took it out of the closet there were dirty socks in the closet as well. Sad. Overall somewhat dated. The apt had good instructions for access. I’m sorry that you had such a bad experience. I have had a conversation with our housekeeper and she wanted me to apologize to you. She was not feeling well, but she said that is not an excuse for not adequately cleaning our unit. Sorry. I am also sorry about the air mattress. Someone obviously put it away knowing it was leaking but didn’t bother to let me know.